About a few weeks ago, I did a talk at Girl Geeks Sydney on how people can defeat the fear monster of public speaking. In a way it was kind of ironic, because even though I put my hand up to do this talk, I was still terrified about it! So why did I put myself through that stress? Well, I want to encourage others to really give public speaking a go because I truly believe it changed me and I wouldn’t be where I am if I didn’t do it. Most people I’ve come across don’t enjoy public speaking. As Mark Twain once said, “There are only two types of speakers in the world: the nervous and liars”. If someone tells you they’re not nervous before giving a talk, most of the time they are lying. Glossohpbia - speech anxiety or a fear of public speaking - affects 75% of people. Some people fear it even more than death! That just goes to show how scary it can be. Surely everyone knows what I know already? I’m not a good presenter. I’ve never presented in front of people before! What if my presentation is wrong? I don’t want to pass on the wrong information to people. Public speaking is damn hard, which is why no one ever started as an expert at it. You see all those amazing speakers on TED? I bet none of them started as an expert. I bet they all became amazing speakers through hours of practice and maybe even years of experience. In fact, Dr Jill Bolte-Tyalor said she practiced her TED talk 200 times! This just goes to show how important practice is to doing a great talk. We all need to start from somewhere. And like everything, with practice, we can all be better at public speaking. But first, we need to step outside of our comfort zone and give it a go. We all want to be liked, so it’s normal to worry about people not liking our presentations. But I doubt any audience goes to a talk and think, “Gees, I really hope the speaker will do a terrible job”. People are generally supportive of the speakers. Yes, there will be an occasion when some people won’t like your talk and that’s just reality. Don’t let that deter you though! Try to focus on the positives, but at the same time, seek constructive feedback from people. Maybe even ask the event organisers for their thoughts on your talk before you give it, see if the content aligns to what they think the audience is expecting. I am sure they would be more than happy to help you as they’d want to have the best event possible. Often we worry the information we give out is incorrect but a lot of the times, there isn’t really right or wrong. It might just be your approach to a problem is different, but it doesn’t make it wrong. For example, if I give a talk about CSS naming conventions, my approach might be different to other people’s, but it doesn’t necessarily mean it’s wrong. We all approach problems differently under different circumstances, and that’s what makes all our talks unique in their own ways. Every decision you make regarding your talk requires you to think critically - from when you decide the topic of your talk to when you present on the stage. There are so many decisions to be made: * What’s the focus of the talk? * How to structure content? * What’s important to the audience? What would interest them? * How to design your slides? * How to deliver your presentation within the time limit? It is therefore no surprise that presentations take so long to prepare for! It gets easier though. The more you do it, the quicker you’ll be able to work out the content for your talk. Doing presentations no doubt teaches you how to explain ideas in a succinct and engaging way. But to also do it within a set time limit as well really forces you to think how to communicate your message in the simplest way. I found this especially true when it comes to explaining code. I once did a talk on block formatting context. The spec for that was already confusing, so needing to explain it to the audience clearly and simply made it a very challenging presentation to prepare for. It got easier though and I feel I got better at it. Good communication skills aren’t just useful for presentations, but are also very important in our every day life. It takes a lot of courage to be able to stand in front of a crowd and tell them what you know. You might get all kinds of worries before giving a talk: are you going to do a good presentation? Is the audience going to like the content? Are you going to stumble and forget your words? But like everything else, the more you do it, the easier it gets and the more confident you become. For some people (including myself), that self-doubt might always be there but I promise it does get easier. Doing talks in front of your peers really increases your profile in the community. And when you’re being thought of as someone who understands their subject matter, doors to new opportunities will start opening up in front of you e.g. invitation to write for publications, travel overseas to speak at conferences and of course, new and exciting job opportunities. Employers love people who’ve done public speaking as it shows the person has confidence and knows what they’re talking about. While this doesn’t mean you instantly get hired (I mean, you still need to go through the normal interview process I’m sure), it’ll definitely give you some extra brownie points. But most of all, public speaking is a truly rewarding experience. The audience is naturally drawn to talking with speakers. So at the end of your talk, you might have people come up to ask you questions about your talk, have further discussions with you and maybe even tell you how much they’ve emjoyed it! And for me, it’s most rewarding when people say they’ve learnt something from you. Nothing beats knowing what you’ve shared with the audience has helped them gain something useful out of it. Ok I’m convinced! How should I actually start? Now that you’ve heard all these great things public speaking brings you, you are ready to give it a go! So how do you go about getting started? First, you need to pick a topic. Pick something you are passionate about and already know well. It doesn’t have to be something that’s ground breaking. Maybe it can be about one particular technology you’ve used in your recent project (people love case studies), or some research you’ve done and what you’ve learnt. It’s best to pick a topic that is good for a 5-10 minutes talk. Planning a talk and preparing slides take a lot of time, so shorter talks mean you don’t need to spend as much time preparing for it and can have more time for practicing. After you’ve got a topic, you’ll need to decide where to present it. Work is often a great place to start because that’s in front of people you know well and hopefully feel comfortable with. Local meetups are also a great place to start. 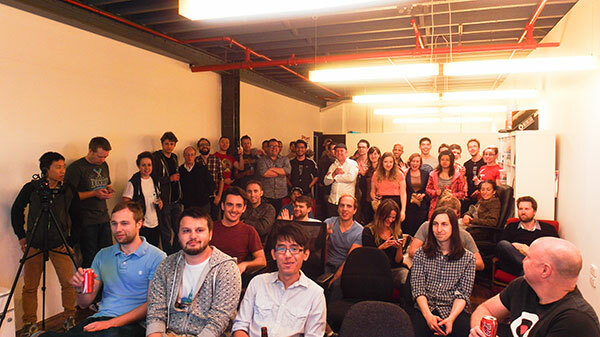 With my meetup SydCSS, we do a first-time speaker night in June to get people who haven’t presented before to do a 5 minutes talk each. Lots of other meetups do lightning talks as well so make sure you reach out to the organisers. No matter how much time you’ve spent perfecting your slides and researching into your topic, in the end it all comes down to how you deliver the presentation. Practice is the key to a good presentation, espeically if you are new to it. The earlier you do it the better, as you might find that you need to adjust your content or how you present because your timing or the flow isn’t quite right. Another reason why short talks are good is because you can practice it many more times! A 5-minute talk means you can practice it 7-8 times in an hour. And don’t just practice in front of your mirror. Make sure you practice in front of an audience, or at least a couple of people who can give you some honest feedback. For all my talks, I always get super nervous a few days before. But once I’ve practiced in front of some people and gone through my slides, I would feel a lot more confident about it. How do I feel about public speaking now? Since my very first presentation, I’ve done about 6-7 more presentations. I definitely feel more confident about my ability now. I even feel confident enough to put my hand up at GirlGeeks to say I wanted to do this talk! Who would have thought! But do I still get scared before presenting? For sure I do! My fear monster is still lurking in the background but I’m able to control it much better and can tell it to go away. Public speaking has changed me. It has opened up so many opportunities for me such as getting to speak at conferences , meeting some great people along the way, expanded up my network which led to job opportunities. But most of all, it’s given me tonnes more confidence. 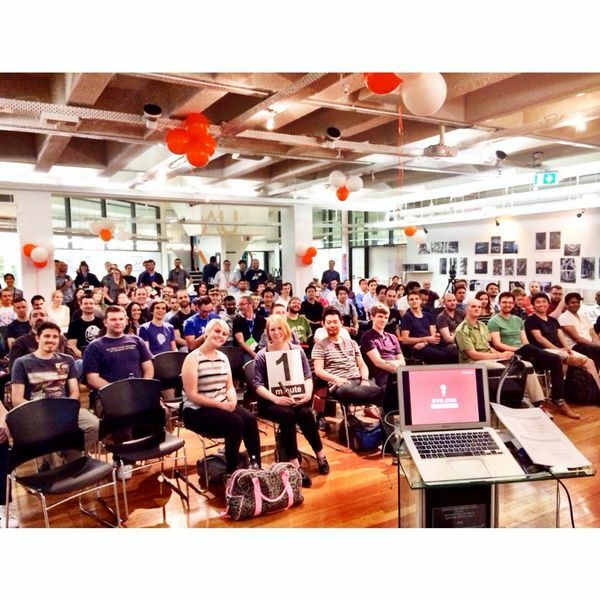 Without it, I wouldn’t have had the courage to start my own meetup SydCSS and even this blog. So, I hope this blog post has managed to encourage some of you to give public speaking a go. If it has, I’d love to hear about it :) Or if you feel like you want to do it but still have some doubts, let me know too and I’d love to help. Finally I have time to look back on 2014 and it’s been a pretty busy year! So what’s the plan for 2015? Right from the beginning, we didn’t like the idea of providing pizza. Most meetups have pizzas and personally, I get quite tired of them. I understand why people serve them though. They are economic for big crowds and can fill hungry stomachs very easily. To provide anything that’s not pizza but also filling is costly. As an alternative, we thought maybe we could serve snacks and fingerfood. It started with homemade popcorn and every meetup we would provide different snacks. We were worried at the start that people will complain about not having food that’s filling. But we let people know well in advance that there’ll only be fingerfood so they should grab a bite before they come to the meetup. So far this plan is going well. By the way, if you’re looking for economical catering option, you should totally get in touch with Made By Mith. They’ve been making all the very yummy fingerfood for SydCSS and also for RailsGirls recently. Most people go to meetups after work. After a long day of work, people will probably want to avoid long presentations. We try to keep our nights short. Most of our nights consist of 2 x 20-minute presentations, with a 5-10 minutes break in between. There were maybe a couple of nights when they went for a bit longer, and we could feel the energy in the room slowly died away near the end. Whereas if we kept it to be about 75 minutes long, we usually ended the night on a high. David and I have attended various meetups throughout the year. One of the main reasons was to observe and learn how others run theirs: how did they MC, how were their seats arranged, how were their projectors and AV systems set up, how was the energy level in the room, how were their nights structured etc. We found this to be a great way to figure out what we want our meetup to be like. Other than working with a co-organiser, having volunteers on the night to help you out is just as important. We have people doing the meet & greet, setting up the space, taking photos, taking video, time keeping, testing and setting up presenters’ laptops. We found it to be better if we focus on MC’ing and welcoming attendees, and get other people to help us with other things on the night. There are too many things to worry about otherwise. Out of everything, one thing that I think made SydCSS a successful meetup is its casual and fun vibe. We found the duo MC’ing really helped with that. David and I always have fun making silly jokes while MC’ing and luckily people do laugh at them. Or maybe they were just laughing at us :) Either way, as long as they laugh, it’s all good. We host the meetup at Web Directions office. Although the space is not very big and it can get a bit cramped, we really love the casual feel of the space. It’s different to your typical office with rows of desks and fluorescent lights. I think it definitely helps with the vibe of the night. It’s really hard to believe that SydCSS grew from 2 members (me and David) to now more than 740 SydCSS-ers. I’m really proud of it. One of my many plans for 2015 is to make SydCSS even better. I honestly can’t wait to see where we’ll be this time next year! Why did it seem like a good challenge? Well, IgniteSydney’s presentation format is a little different: 5 minutes talk, 20 slides, 15 seconds per slide. So yes, the presenter doesn’t get to control the slides. What I didn’t realise was that you don’t get presenter notes AND what’s the upcoming slide. Fitting content into a strictly 5 minute slot is hard enough, but to have no control over your slides, that’s just scary and makes it ten times harder. But it really forces you to be very precise with your message. And even if you slip a bit in your talk, you would have known it so well that it’s easy for you to recover. So how did I prepare for it? Like any talks, I jotted down some notes first, with points I wanted to cover. Then I picked out some key ones I wanted to make slides for. I had no idea how long 15 seconds was, so I tried to go through the talk with the slides I’ve got just to get a rough idea of timing. I figured out 15 seconds was roughly 1 long sentence / 2-3 short sentences for me at a particular pace. From that, I worked out what the rest of my slides were, keeping in mind the timing. Once I had all the slides, there were lots of practice, tweaking, moving slides around, re-doing slides, more practice… just to make sure the timing was right and that the flow was good. I don’t think I’ve practiced a talk as much as I did with this one. I learnt that I had to somewhat improvise and adapt: if I spoke a bit faster at one of the slides, I would need to slow down at the next one. It took a lot of practicing to figure out the timing, remembering what I needed to say and what the upcoming slide is. Then came the night. I was a bit nervous but managed to calm myself leading up to it. When it was my turn, I stepped onto the stage, then 3, 2, 1… I began my talk. I was a little shaky at the start but once I got into the rhythm of it, everything just flew nicely. It went fairly well overall. There were a couple of spots where I had a micro mental blank but I recovered. I’m really glad I gave IgniteSydney a go. I didn’t realise how much I relied on speaker notes and being able to see the upcoming slide until I did this talk. But it really forced me to know my talk extremely well and to keep my points really concise. It was probably the most challenging talk I’ve prepared for, but I think the things I learnt from this experience will make my future talks better. Recently at work, we started doing Show & Tell at Friday lunch every few weeks. The idea is to share knowledge within the team. My manager asked if I’d like to do one about accessibility and I did not hesitate in putting my name down for it. Why? It’s not really because I love presenting (at the same time I don’t hate it anymore). It’s an easier and better way of raising awareness and distributing knowledge about it. Easier than trying to catch every problem in code review. Accessibility is a very much undervalued topic. It’s great to see that there have been more talks about it in conferences recently, from people like Marcy Sutton. A lot of the times accessibility is ignored not because people don’t care, but because they don’t know about it, or not aware of how easy some things can be done to improve it. That’s why I wanted to do the talk: to raise awareness about it within the team. So came presentation day. I was feeling pretty prepared, even though I didn’t have time to practice my talk. But I was feeling relaxed and ready to get into it. Everyone joined me in the boardroom, I had my laptop connected to the big screen. All set! Then I began my presentation. As I was presenting, it hit me how different this was compared to presenting at a conference. At a conference, the room is a lot bigger and there are a lot more people. When I’m on the stage, my eyes go everywhere and constantly moving my focus between people. But in a small boardroom, I could see what everyone was doing. And it got to me when I saw people looking disengaged. I think I lost a bit of my energy then and started having doubts. Was I boring? Were my slides not good enough? Was the topic not interesting enough? Was I not doing a good job at explaining? The presentation ended. People clapped. Got a couple of questions. And that concluded the Show & Tell. I didn’t get the same high I got after presenting at a conference. It was strange. I even felt a bit flat and started thinking if I wanted to do another presentation. “Ah well,” I thought. People were probably tired on a Friday. Maybe I should have made it more “fun”. Maybe because my topic is not about something new and shiny so people weren’t interested. When I got back to my desk, the project coordinator messaged me to say that after my talk, she had a look at our company blog and felt that some of the text was a bit hard to read so she updated it to make it more readable. The next day, in an email thread with the managers, one of them asked if we should add role="navigation" to one of the navigations in our API to make it more accessible to screen readers. And after I emailed the team a link to my slides, I got an email from someone in our Dublin team saying he couldn’t believe how ill-informed he was on the topic until he saw the slides. So this. This is what it is all about. I wanted to do the presentation to raise awareness. If something from the talk sticks in one person’s mind, then I think my talk is already worthwhile. More than one person? Well, that just made my day :) Doing a presentation isn’t about getting a reaction from your audience, or getting applause at the end of it. It’s about sharing what you know and helping others get something positive out of it, even if it may not be apparent at first. [UPDATE] I also blogged about the presentation on Learnosity’s blog, with more details around what I talked about in the presentation.